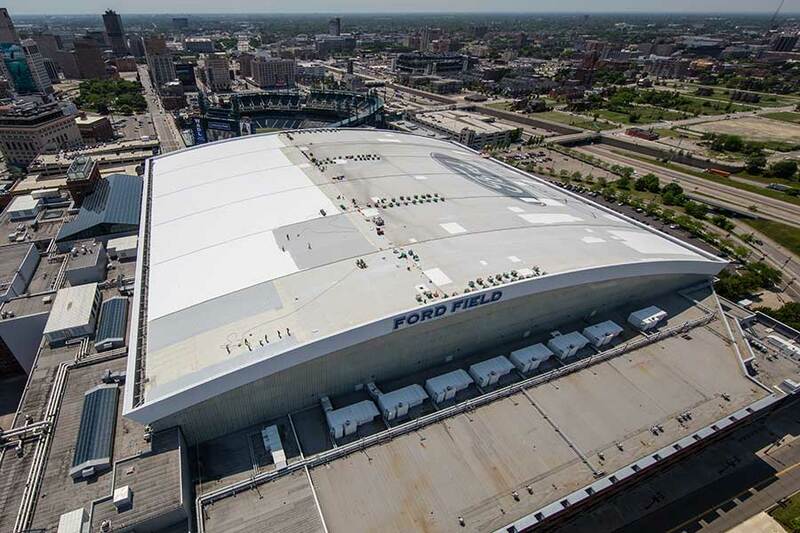 Enormous roofs—such as this one covering Ford Field in Detroit—require exceptional planning, logistics, and craftsmanship. Roofing is a challenging job. It requires skill, strength and experience. Often, workers are installing roofs in uncomfortable temperatures and in difficult situations. Make a mistake in your roofing application and the integrity of your whole structure is compromised. Amplify those challenges on roofs that can be millions of square feet—as in some of the country’s largest applications— and you’ve got an exceptional situation. 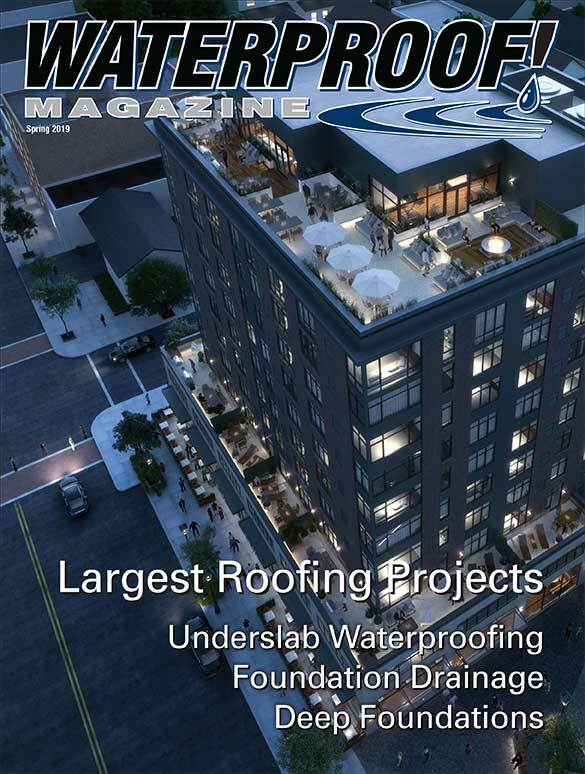 Here, we look at some large roofing jobs where those challenges were overcome to complete some incredible projects. 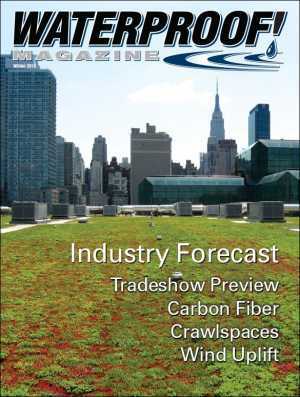 Green roofs are becoming more common as building owners are increasingly understanding the positive environmental impact. Green roofs provide insulation and reduce energy usage. They aid in the removal of air pollutants and assist in stormwater runoff management. They provide forage and habitat for bugs, birds and bees. Not to mention, they’re beautiful. Since the building’s construction, other high-rise apartments have been built nearby, and the green roof provides a glimpse of open space for those residents. 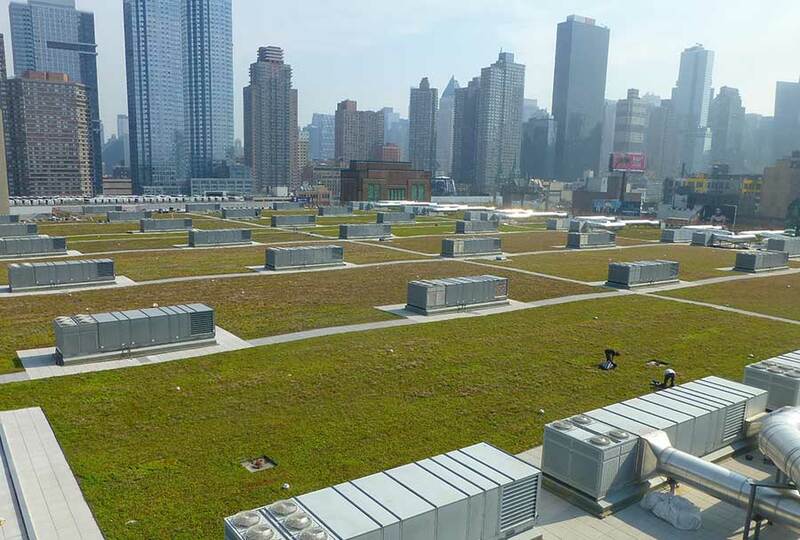 The green roof atop the Javits Convention center in New York City covers 300,000 square feet, and is the second largest vegetated roof in America. 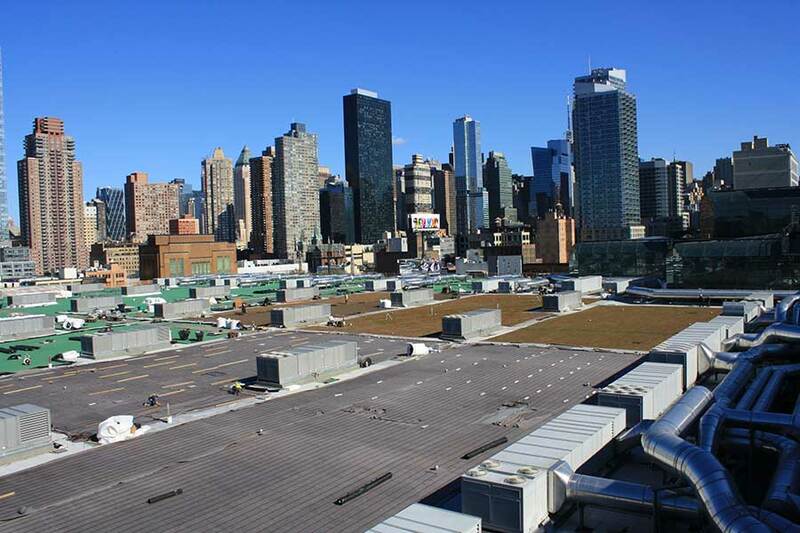 The Javits Center’s 6.75-acre extensive green roof (soil depth 6 inches or less), provided by Xero Flor America of Durham, North Carolina, is the second largest of its kind in the United States. It covers 840,000 gross square feet of exhibit space—New York City’s largest venue for conventions, trade shows and other events. The facility was designed in 1986 by iconic architect I. M. Pei and in 2010 needed a makeover that included things such as pixelated bird-safe glass, which has reduced bird collisions by 90 percent. Averaging 50 inches of rainfall per year, the green roof significantly alleviates stormwater runoff. 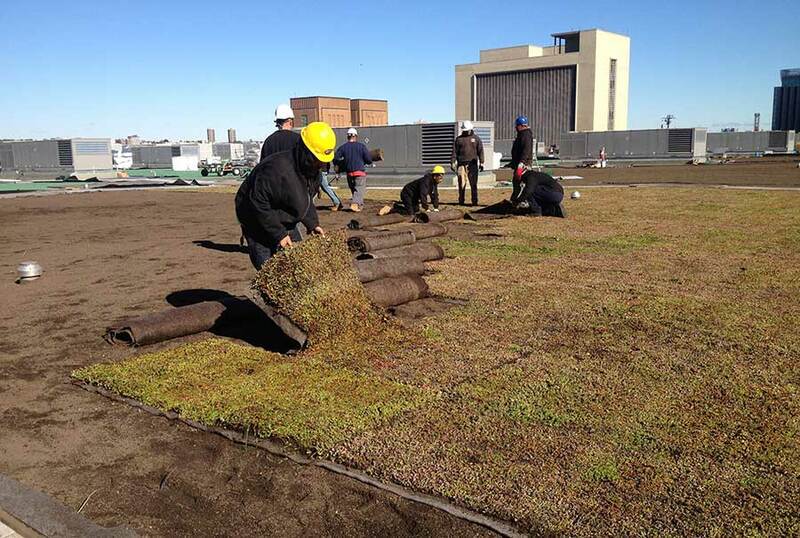 Xero Floor calculates that the green roof prevents approximately 6.8 million gallons of runoff per year. New York-based construction manager Tishman Construction managed the renovation. Touches such as energy efficient lighting and an energy monitoring dashboard allowed them to achieve LEED Silver certification. The weight of such a large green roof proved to be a challenge. Concrete pavers, as a protective element, were nixed early on because they would have required a structural upgrade to the roof to support their weight. Ultimately, the Xero Flor Green Roof System was selected based on having been used on several other large-scale projects in both Europe and the U.S. Sections of Xero Flor pre-vegetated mats, the retention fleece layer, drain mats and root barriers can be rolled back for roof maintenance if necessary. 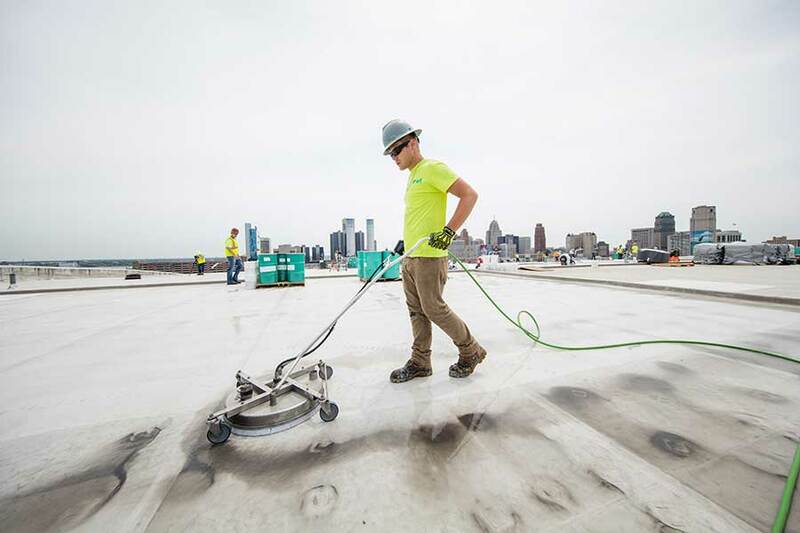 The roof installation was officially completed in October 2014 and measures 297,000 square feet, making it second only to the Ford Motor Company’s River Rouge Plant near Dearborn, Michigan. That roof is also a Xero Flor roof. Ford Field, home of the Detroit Lions, was built in the year 2000, and 14 years later needed a roof upgrade. 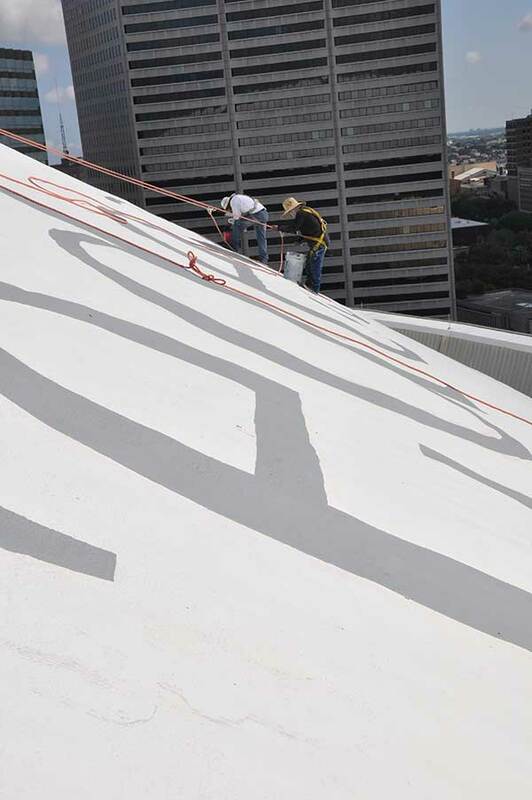 The original scope of work was to refurbish the Ford Field letters and logo on the roof and have them done by the beginning of football season in 2016. James Getzen, senior field advisor for Tremco Roofing, suggested that a roof analysis be performed before spending several hundred thousand dollars on the logo, and avoid a situation where they might find out later that the roof was having problems that could have been fixed at the same time. 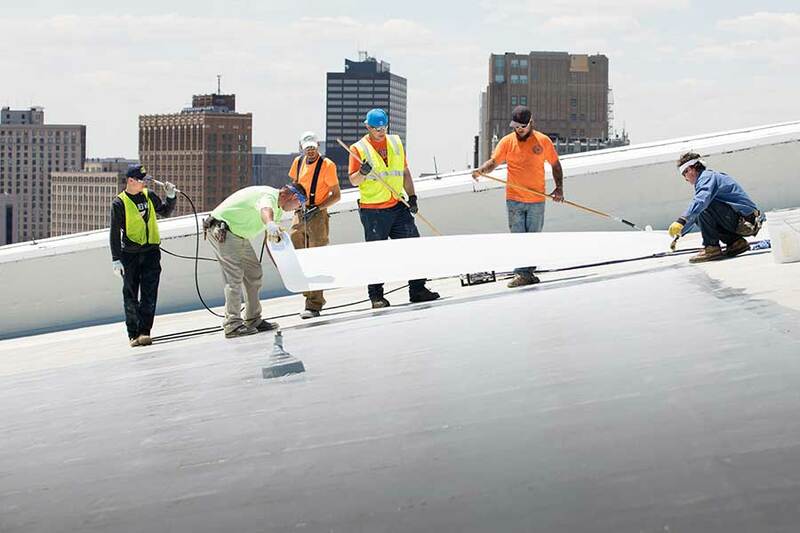 Replacing the 340,000-sq.-ft. domed roof of Ford Field was a major undertaking. Seven semi-trailer loads of material were delivered to the roof via helicoper. Their infrared analysis of the roof of the home of the Detroit Lions found damaged areas but showed that the roof’s overall integrity was good. However, the 340,000-sq.-ft. domed roof, only 14 years old, did need to be restored after having suffered from Michigan’s cold winters and hot, muggy, summers. Defective areas of the existing single-ply PVC membrane were replaced with a similar TPA thermoplastic membrane. The remaining 90% of the roof was thoroughly cleaned and topped with a new white reflective coating. The existing construction started with metal decks, then a fire retardant gypsum board followed by multiple layers of isocyanurate insulation and a DensDeck cover board. The roof was thoroughly cleaned with an environmentally-friendly cleaning system and then primed. A fluid applied base coat was used in conjunction with Tremco’s Permafab polyester reinforcement, followed by a white top coat. The immense size of the roof required seven tractor-trailer loads of coating, which were transported to the roof via helicopter. The most recognizable feature of the roof is the famous Ford oval and logo. In this case, Rust-Oleum Corp. custom-blended “Ford Blue” that was painted over the AlphaGuard Top Coat. The Ford logo itself covers more than 60,000 square feet! “The white AlphaGuard system is highly reflective, and that choice alone helps reduce energy usage on a roof of this size,” says Getzen. 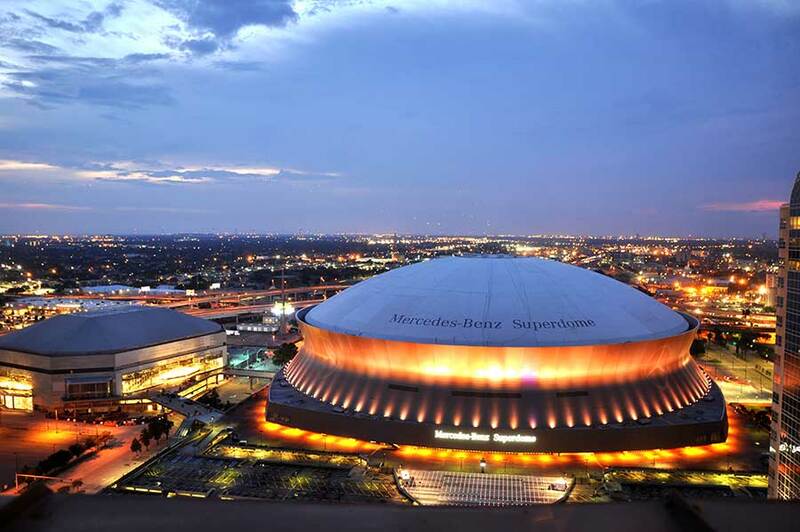 The Mercedes-Benz Superdome in New Orleans is another iconic sports venue. The 425,000-square-foot home of the Saints was damaged by Hurricane Katrina in 2004. It’s the largest dome structure in the world, and it needed help. And like the Ford Field venue, this one also had the added challenge of needing the Mercedes-Benz logo and lettering which was hand-applied using brushes and rollers. New Orleans-based Trahan Architects did eight 10’x10’ test patches on the roof that they left to weather for nearly a year before choosing the one that had the best color retention and resisted dirt and mold growth. The winning product was Kymax, a white low-build elastomeric coating from Quest Construction Products. 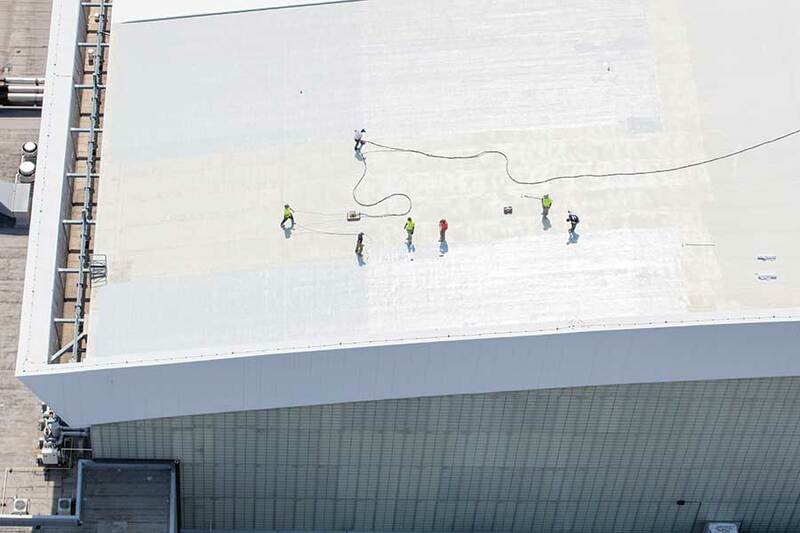 With the state eager to have the facility repaired in time for football season, roofing contractor Brazos Urethane had just 180 days to take the roof apart piece by piece and replace it with new polyurethane ­coated decking. The Louisiana Superdome covers 425,000 sq. ft. The roof was updated with a reflective spray-applied coating. Material was staged on the field inside and hoisted 300 feet to the roof. Safety was paramount, with the crew and materials tied off at all times. Brazos got to work pressure washing the 9.6-acre roof. The previous 18-gauge decking was found to have been badly rusting. The new decking was screwed down into the existing structural steel of the dome and then they applied one 16-mil layer of Kymax solar gray basecoat. Dividing the roof into 16 pie-shaped sections and then further subdividing it helped ensure that they applied everything evenly. 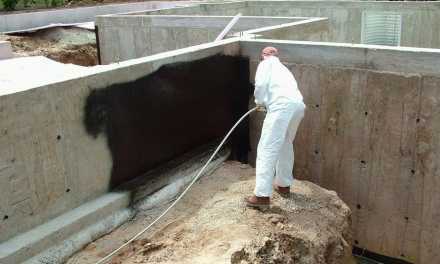 After the basecoat, they applied a repair layer of polyurethane foam 2 ½ inches thick, which used nearly half a million gallons of material. This was topped off with six coats of urethane coating applied to a total thickness of about a nickel. Now, Keller says the monolithic roof is extremely solid and will not blow off again. Finally, they spray-applied two layers of the white topcoat, each six (wet) mils each. This innovative coating contains IR-reflective pigments, which help lower the surface temperature by around 30%. Keller says they had the deck delivered into the dome and then had to ship it up to the top, which was 300 feet from the surface they were hoisting it from. An opening at the top center of the dome was equipped with eight hoists for taking materials from the field to the top of the dome, and getting the old materials back down to the dumpsters. The Mercedes logo—which you can only see if you fly over it from above—was so large it was impossible to stencil. They found an old-school sign painter to go up on the roof with a tape measure and plot it out by hand. Keller says their biggest concern was, naturally, gravity. Well, that and spilling the “Mercedes-Benz black” paint on the white coating. “We actually had guys stand in line in case a rope or something did knock something over so that they would be ready to clean it,” he says. For safety, everyone was roped off at all times. Covering just less than 30 acres, the metal roof on this warehouse in Illionois is one of the largest in the U.S. 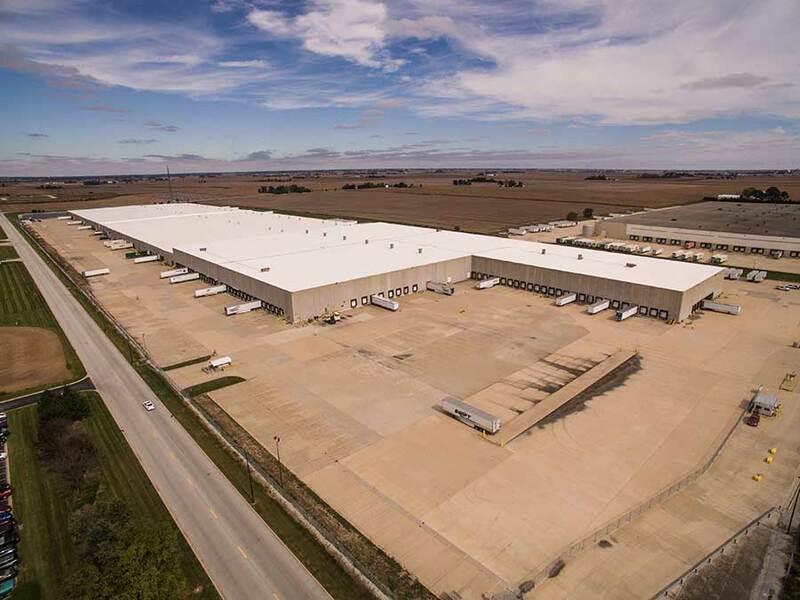 The seam metal roof was finally showing its age, and approximately 400,000 square feet of ballasted EPDM of this 1.3-million-square-foot roof needed to be replaced. 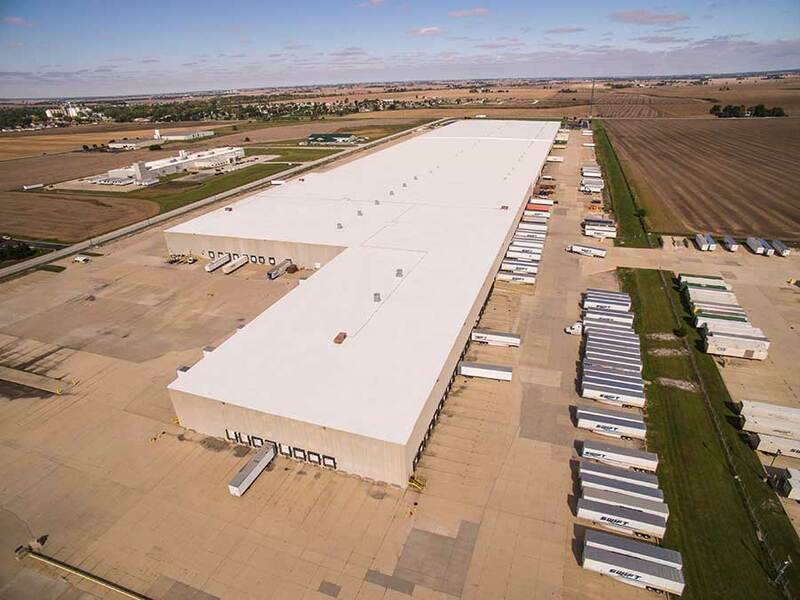 One of the largest roofs in the country, the metal roof of this Illinois warehouse covers nearly 30 acres. It required 180 semi-truck loads of EPDM roofing material. 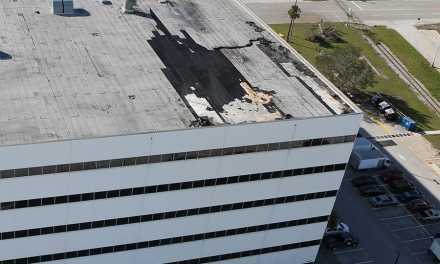 As the roof repair project was being planned, leaks began. Sentry Roofing Inc. in Covington, Indiana, sprang into action. As the hub of a large corporate retailer’s online business, they couldn’t afford a disruption to that schedule, a full tear off was not an option. The roofing was done while the facility was in use. “We knew that Duro-Last was the best option because we were able to completely overhaul their roofing system without tearing off the original materials,” said Dan Fowler, Sentry Roofing’s sales rep. 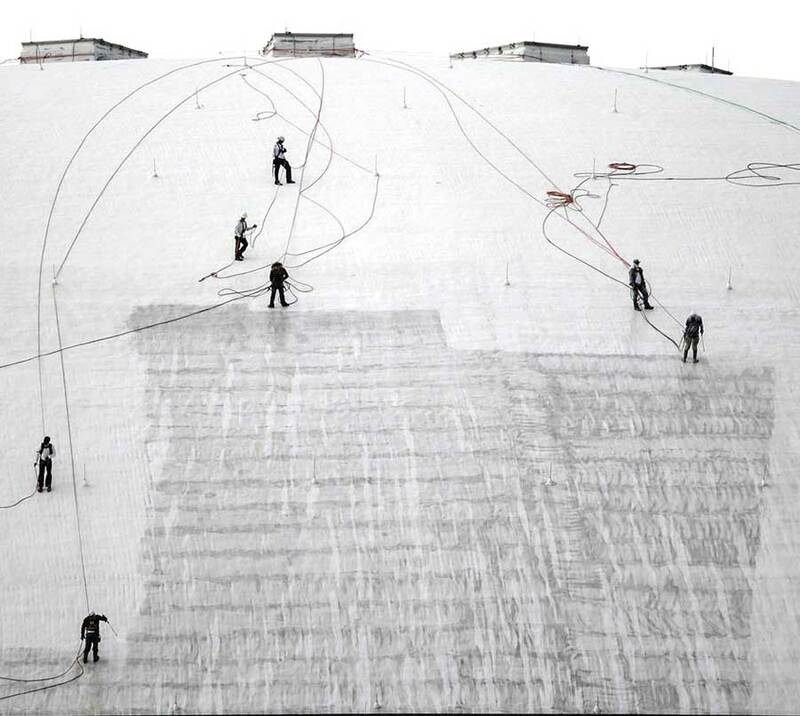 It is the company’s largest project to-date, and utilized a 60-mil membrane, stacks, and custom curbs. It took about 20 workers approximately three months to complete the project. 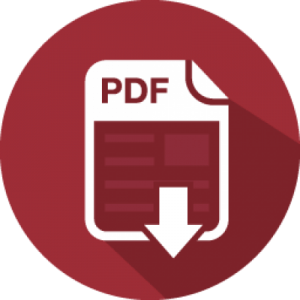 Vanessa Salvia is a freelance writer specializing in the construction industry. Her work has appeared in numerous national and regional publications.